More sweet images from Stampin Up's Retired "Winter is Calling" stamp set. This time I paired it with vintagey paper from Graphic 45. More transparency snowflakes of course! I also have been really loving this Spellbinders die that looks like you've used a pinking shears around your image. Gives it that extra vintage touch! Speaking of vintage; I scored this fun coffee can at Friday's estate sale too...I loved that it's tag line is "THE HAPPY BLEND COFFEE!" I think it looks super xmassy in my kitchen, with some happy yellow flowers from a sweet friend. Hope you have the HAPPY BLEND coffee this weekend at your family gatherings! Happy Holidays, all! I'm not sure if you can see it or not, but I used a bunch of the fluffy Melissa Frances Mica flakes to imitate white, fluffy snow on the lake! I also created another card with this set that I'll show you tomorrow. I get sort of bored doing a ton of the same cards, so I split them up a bit. Some friends will get the skater, some will get tomorrow's card. ARE YOU READY FOR XMAS? It's almost here! See you tomorrow! Hi friends! More putzing around going on tonite; I needed a couple of money/giftcard holders for my friend's daughters, so I whipped these up using some red paper lunch bags I scored at Target this summer. Our Craft Lounge came out with these fun little decorated reindeer from the "Reindeer Games" set, and they have a coordinating set called "Reindeer Puns" that I had a hand in creating for OCL. I thought it would be fun to pair up some kids jokes with these cartooney little guys! What do reindeer use to decorate their Xmas trees? HORNAMENTS. And, which of Santa's reindeer has the cleanest antlers? COMET of course. I think the girls will love these. (Especially since there will be money in the little open flap inside.) I used red glitter for the reindeer nose, and my transparency snowflakes to make the holder merry. Here's what the inside looks like...I just folded the bag into a triple fold, and glued the inside of the bag down in the middle. The open slot is where you place a giftcard or money. I put my punchline, in the center of the trifold. EASY! I also have to show you a fun little box of HORNaments I scored while junking last Friday. I love leaving them in the boxes under the tree, for them to sparkle under the lights! AND I finished my Christmas cards yesterday! I'll have 2 more blog posts before I leave for the holiday~ stay tuned for my Christmas card photos! Good morning everyone! Crafty Secrets is getting ready to release some of their new CHA sets, and since I was guest designing this month, I got to play with the design team girlies and play with some of the new sets! Sandy has lots of fun stuff in store for you guys; she's on a roll (as usual) with her new, jam-pecked, ERR, I MEAN PACKED stamp sets! The set I got to play with is called FARM CHICKS! The chicken images in this set are SO COOL! And the chickens have PARTY HATS that you can add to their little chicken heads! I had some old raffia off of a gift in my ribbon supply, so I cut it up into smaller pieces and used it for straw on these cards. I wanted to give them a country feel. I love doing little unexpected details on my cards. Best of all, it didn't cost a dime! More samples coming up this week! Happy Snowy Saturday, girlies! I want to show you another Crafty Secrets project that I made after I was inspired by these cool Pottery Barn ornaments! I loved the look of these ornaments but was thinking there was NO WAY I'd pay that price for them unless they were on clearance. Then the lightbulb went on in my head, that I own a FEW Crafty Secrets stamps and I could possibly recreate these myself! So I want to show you where I went with these ornaments as my inspiration! I started with a blank sheet of cardstock, and stamped music notes all over my paper (music notes from Crafty's Artsy Banner stamp set). Then I stamped birdcages, postmarks and birds (from Crafty's "Birdies" set) all over the sheet and colored them in with copic markers. This became the basis for my ornaments. I used my Spellbinders Circle dies to cut a bunch of circles out of it. Then I covered the circles with Versamark clear ink, and then dumped UTEE clear embossing powder all over them. Once you heat up the Utee, the powder melts and creates a clear plastic sheen over the top of the ornaments. Then I just matted them with a scallop circle that had been covered in Martha Stewart white-gold glitter. I also repurposed some old ugly buttons I had, by dipping them in mod-podge and smothering them with glitter! 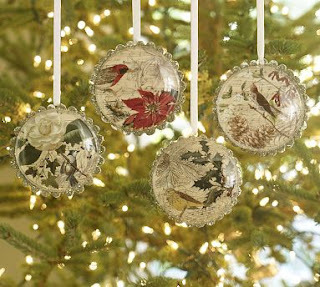 Punch a hole in them, add ribbon, and you have cute little individual ornaments for gifting! I also thought it would be fun to give these as favors for a holiday party, so I folded some embossed cardstock in half, and took a 'bite' out of them with a Nestabilities scallop circle. I used vintage sheet music and stamped names on them, and added them to the front. The ornaments sit right in the little holder, and the guest can remove the ornament and take it home with them! I also repurposed some old ugly buttons and covered them in mod podge and glitter, and hot glued them to the front of the ornaments for extra sparkle. After I was done, I found an old cylinder vase and covered it in sheet music to make a candle holder for the center of the table. I used a medallion pinwheel for the center, and hot glued one of the ornaments to the middle. So there you have it; a cheap and fun alternative to going out and spending money on holiday decor! Good morning everyone! I have the day off and am snuggled in my craft room with coffee today, so I thought I'd start the day off with a blog post. Over the Thanksgiving holiday, I stamped off a bunch of Crafty Secret's "Little St Nick" images to use in Christmas projects, and colored them in. I started out making Christmas tags with the colored images, and then used one in my traditional bingo card ornament, for my bingo card tree! I stamped off a bunch of snowflakes on transparency sheets and embossed them..they've become the main theme running through all of my Christmas projects this year. I thought I'd give a short tutorial today and show you how to make transparency snowflakes! I've been going crazy adding these snowflakes to my projects this month...they are so EASY. Snowflake stamps (I used Crafty Secrets "Christmas Joy" set and Pinefeather Press/Papertrey "Snowfall Additions"
Rub your embossing buddy over the transparency sheet. This will reduce static and help the embossing powder to only stick onto the stamped image instead of the area surrounding it. Stamp your snowflakes on the transparency (with the versamark ink) and then dump white detail embossing powder on the flakes. Dump off the excess embossing powder and snap the back of the sheet a few times with your finger, to make sure the powder is just on the snowflakes, not the surrounding area. Then take your heat gun and run it over the flakes until the powder melts & becomes shiny. Then punch your flakes out with a spellbinders scallop or circle die, and glue buttons to the centers. Easy~! Hope you all can take some time this season to sit down and indulge your creative side! I'll have another tutorial this weekend for you and more Crafty Secrets inspiration soon! Hope everyone is having a cheery holiday season and is snuggled in for for some December crafting and holiday merriment! I've been asked by Sandy Redburn at Crafty Secrets to be a guest designer for her for the month of December, so I'll be posting some fun inspiration and projects this month and am contemplating blogging occasionally again! So put me on your favorites list and stop back for some tutorials and merriment! A few weeks ago I had met a friend at Archivers and they showed us how to make some cool pinwheel medallions with a scor-pal. My inspiration fires were LIT and I came home and started making medallions like a crazy-girl. I decided to do a tutorial for you, since a lot of the projects I've done for December involve the medallions in varying sizes. Sandy had sent me a few sheets of her Christmas images, so I decided I'd make a medallion banner for her to hang in the booth. I cut them all up, matted them with red paper and glittered the edges. I also added some homemade transparency snowflakes all over to make them snowy and festive. (I'll be showing you how to do the snowflakes in an upcoming post). Each medallion has it's own little unique doo-dads (technical term) attached, but I kept them simple so I could crank out a bunch at once. Try one yourself at home...I think you'll find tons of uses for them! Here's how to make them! For the larger pinwheels, I used a 6 x 12 sheet of paper. Lay it on the scor-pal and score lines all the way down at 1/2 inch intervals. To add the little border strip of paper, I added a 1 inch strip to the center of the paper before scoring. After scoring, cut the paper in half, cutting directly down the center of the paper. You will end up with (2) 3" strips. Then fold the strips at the scores, to make accordian strips. Hot glue the tails together on both ends. Helpful hint: fold one strip with the tail end facing up, and one with the tail end facing down, so that they clasp together. You will end up with accordian circles that look like this. Now press down on the center of the circle forming sort of a 'jello mold' shape. The circle will pop all the way down when you press down on it. Try experimenting with different size strips...I used 3", 2" and 1.5 inch medallions for my banner. Stop back soon, as I'll have more projects to show you and ways to use these fun little decorations!!!! They are so EASY!! !